First four minutes after heart stops are the most critical. 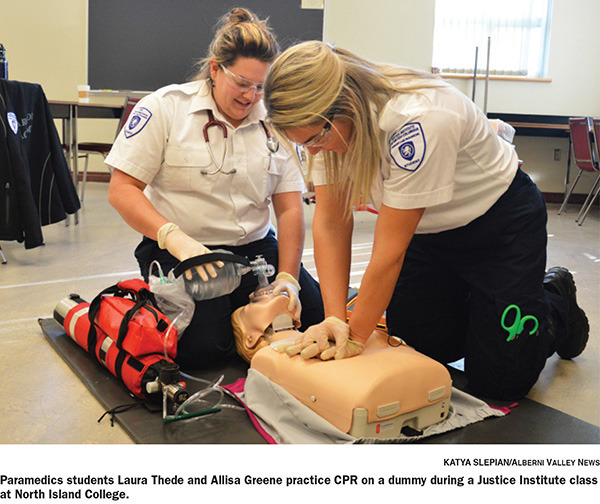 Paramedics students Lana Koehle and Petter Flaatten practice CPR on a baby-sized dummy during a Justice Institute class at NIC. The difference between life and death is a heartbeat. Without one, a person is already dead—and there’s not much you can do to make it worse, said B.C. ambulance service paramedic Deb Roberts. It’s not difficult to learn, but it should be essential for everyone to learn. It’s the No. 1 tool in the toolkit for emergency responders. “A basic CPR class is about four hours and you learn about choking, CPR on an adult, a child and a baby,” Roberts said. Paramedics go even further in their training with a three-week emergency medical responder (EMR) course and then a nine-month primary care paramedic course. “They did a month of online, they do four months in the classroom, 14 shifts on an ambulance, three shifts at the hospital and one shift in a nursing home to meet all the national occupancy standards,” she said. It’s a lot of training and according to Roberts, the focus on CPR is strong. But while paramedics are well trained in it, sometimes the professionals can’t get there soon enough. That’s where general knowledge of CPR by members of the public comes into play. In the time gap between when someone stops breathing and help arrives, plenty can go wrong. Even if someone can’t help the victim’s heart start beating on its own, CPR will still help. “If you’re doing CPR, you’re continuously pumping oxygenated blood around the body and feeding the brain,” said Roberts. In fact, for someone without CPR training it’s better not to worry about mouth-to-mouth. According to Roberts, worries about further hurting the victim are pointless. “You’re not going to hurt them. They’re already gone, so anything you do is better than nothing,” said Roberts. Even if you miss the fact the patient has a slight pulse, it’s still better to try CPR. The ideal scenario is everyone having some basic CPR training, said Roberts. “Everybody should know how to do CPR All of the grade 10’s get it in P.E. and our high school is now doing the EMR, the next level of training,” she said. First responders—some firefighters and search and rescue—will get it as well. Otherwise, it’s offered via Echo Centre, North Island College and other places within the community; check www.redcross.ca.